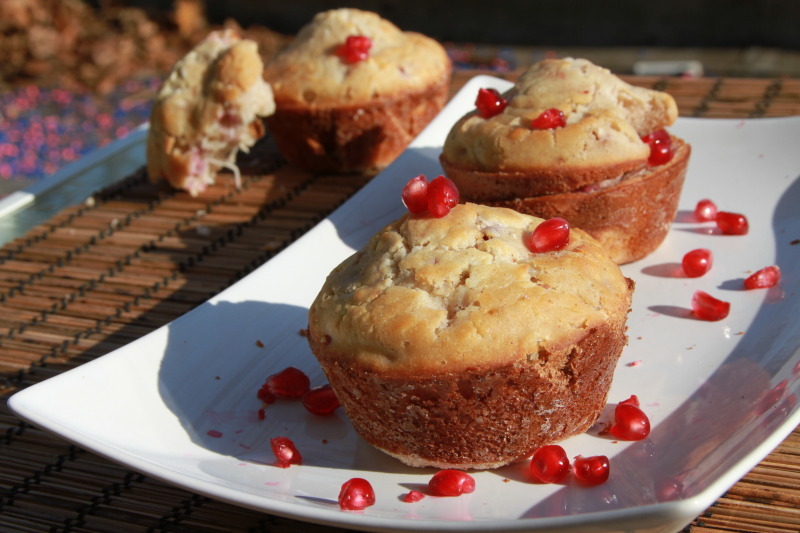 Pomegranate & Coconut Golden Raisin Muffins – Guest Post from Free Spirit Eater! I love Kym’s incredibly warm and inspired love for food. She’s a trained chef, and with her fiance Tim creates recipes for her site that look mouth-wateringly delicious. If they lived closer by, theirs is an apartment I would randomly be stopping at during dinner hours, pretending I found one of her sneakers on the sidewalk or asking to borrow a cup of milk (which I don’t drink) or something. I told her I only had one catch – she’d have to guest-post for me! I’ve never had a guest-poster on my site, so the idea of swapping made me super tingly excited. Then the holidays came, and went, and Kym prepped for a big apartment move, and I got a new job, and our recipes got away with us. Until today. I welcome Kym to The Dusty Baker with open, hug-ready arms. We met a few months ago through writing for Bromography.com. Then Kym accompanied me to the Great American Pie-Off, lending some moral support for my entering my first pie competition where we took home 2 of 4 awards. She’s a very talented cook and food photographer, and I’m sure she’ll continue to achieve incredibly great things. Head over to FreeSpiritEater to grab my recipe, Kumquat Chutney Hand Pies. And while you’re there, flip through her mouth-watering recipes. When Jacqueline asked me to guest post on the Dusty Baker Blog for a recipe swap I immediately felt a sense of excitement. I love her site, am a huge fan of her writing and consider her a friend. I can only wish that one day my writing could be as intricate, descriptive, delicate and powerful while still being witty and quirky as Jacqueline’s writing style is. But I also felt my quick moment of panic. What did I get myself into? I am no stranger to gluten free cooking. I’ve altered dishes to make them gluten free by request when I worked as a line cook. But until this recipe swap, pretty much every baked good I had ever prepared requires some type of glutinous ingredient. As someone who has never had a food allergy in her life and is a free spirit who simply consumes what is placed before her, working with restrictions was quite a challenge. Whenever I thought of a recipe to attempt, I stopped myself realizing it wasn’t gluten free. Through this challenge and experiment, I have gained a great respect for anyone with a food allergy. I found this gluten free muffin recipe online which asked for soy milk, sesame oil and oats among the list of ingredients. I used neither of these and altered it entirely where it does not resemble the original recipe in any way. I had never worked with white rice flour before, but purchased it for this special occasion. The texture was different, lighter, leaving a lovely scent as I plopped down the first cup full. 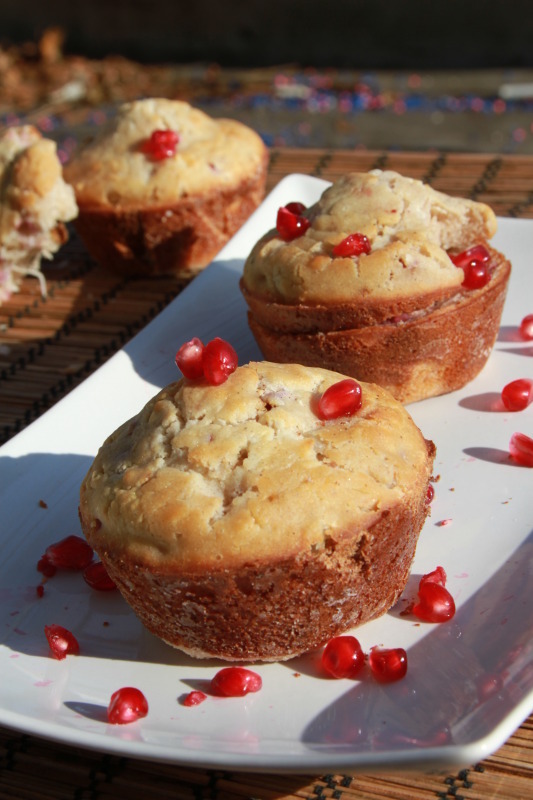 Since pomegranates are still in season, I worked some seeds into the mix as well as sweetened coconut flakes and golden raisins. They didn’t rise as much as I wanted them to, so another ¼ teaspoon of baking powder wouldn’t hurt next time. A bite into the finished product resembled a mix between cupcakes and muffins in texture. Not overly sweetened, but a pleasant light feel with sparks of pomegranate, sweetened flakes and juicy golden raisins teasing your palate with each bite. Attempting my first gluten free baking project was a mix of emotions. I think the point of this swap was to get your hands dirty while being thrown out of your comfort zone. It was a challenge, but a successful one none the less. The muffins are not that big and have plenty of natural ingredients adding a distinct lovely taste. For those with a dairy allergy, soy can replace the cow’s milk. Feel free to switch the coconut flakes for toasted sliced almonds, or other nuts and dried fruit. Enjoy! Mix all dry ingredients in one bowl, and wet ingredients in another (except for coconut oil, pomegranate, coconut flakes and raisins). Bring ingredients together by combining in one bowl, and then add coconut oil, pomegranate seeds, golden raisins and coconut flakes, mix well until fully incorporated. Bake for 18-20 minutes or test with a toothpick to make sure it’s ready. Let cool, remove and serve. Cover in saran wrap to store. Kudos to Kym for jumping into gluten free baking and coming up with great results first time out! Great guest post, great recipe and wonderful guest. Love this guest post and I am a HUGE fan of pomegranates. Thanks for hosting Kym here Jacqueline. I was so happy to have her be my first post – and her first gluten free recipe at that! Dusty, you make such fabulous cakes. These are truly original and sound absolutely wonderful. So fun to see you guest post on eachother’s blogs! Kym, I’m so impressed that you took the challenge and made an amazing looking gluten free muffin with your first attempt! Beautiful! It was fun! Love the cross between blog/virtual and “real” friendships :) And was so psyched she did a gluten free recipe for me! Always exciting – and obviously delicious. For someone who’s never really baked gluten-free before you did a heck of a bang-up job! Good for you Kym! Wow!! You guys are too sweet (no pun intended) =] I was nervous how my newbie gluten free recipe would be judged. But I’m thrilled you guys liked it! Muffins look delicious, Kym! I have never tried gluten free baking…you two just inspired me! Great job on both guest posts, ladies! Sorry ladies, I am late to the party. Been a long week. I am so glad you asked Kym to guest post. I adore this woman to bits and pieces. She is such a sweetheart and incredibly talented. I love how diverse her blog is. Her range is limitless. Okay, I’m a bit late to this post and I haven’t tried the recipe. I live in an area where some of the suggested ingredients are hard to come by. When I read the author’s adjustments to the original, I wondered about using coconut milk for the milk, regular oil for the coconut oil and not sure what to do for the pomegranate. I could just leave them out I suppose or maybe drop in some dried cranberries to get the colour. I do so covet gluten free recipes that work and don’t taste like dry _____ whatever – fill in the blanks. After several failed gluten free baking attempts, I came to realize that it takes a lot to get it right. Thanks so much for trying to bring those of us with flour and dairy issues baked goods we can eat. Thanks for that suggestion. I’m not big on soy milk but I’ll try the almond milk. Didn’t think about the weight of the coconut milk. I look forward to trying these. I just made some flourless peanut butter cookies. It is so great to be able to eat something sweet and know I won’t pay for it later!